Italian Legislative Decree 192/2005, together with Italian Legislative Decree 311/2006, which contains some corrective and repealing provisions, and Italian Presidential Decree 59/2009 (implementing Decree 192/05 – entered into force on 25th June 2009), require that windows and doors have high thermal insulation performance like that achieved by Metra systems windows and doors. 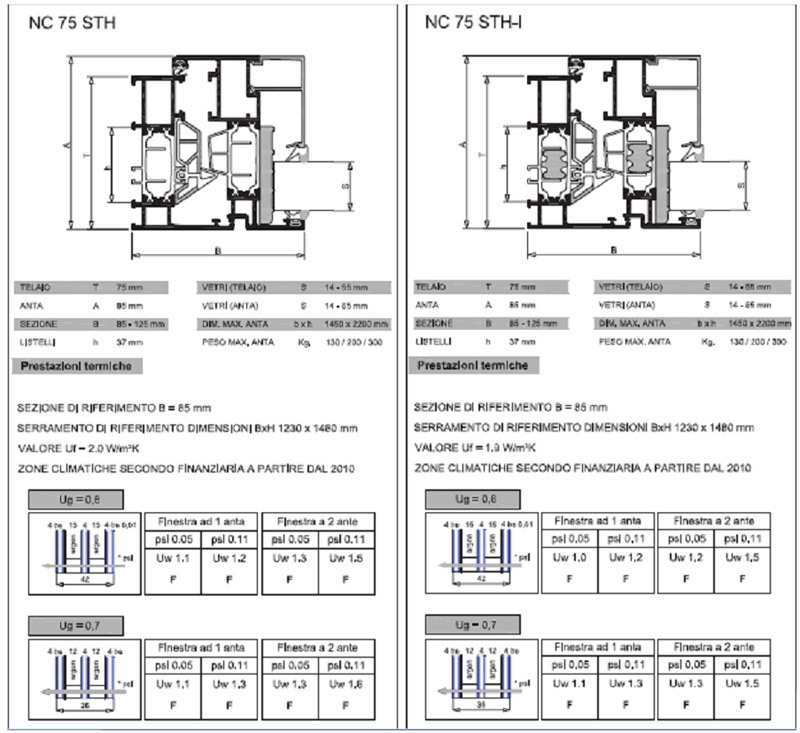 The legislation currently in force in Italy regarding energy saving requires that the maximum values of Thermal Transmittance of windows and doors (complete with glazing) are lower than the Uw values determined at the national level in accordance with the Climatic Zones as defined by Decree 412/93 (subject to further restrictions due to regional or municipal regulations). 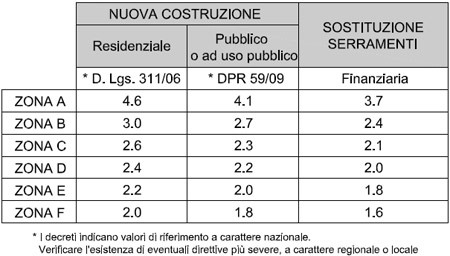 The Uw limit values required to obtain a tax deduction of 55% based on the 2010 Italian Financial Law for the replacement of windows and doors are also shown in the table below, again in accordance with the Climatic Zones. To find out which Climatic Zone each Italian municipality belongs to, please select “Climatic Zones”. With regards to the Uw value calculations shown above, the reference Uf values of the frames for each METRA series are used (in reality, each individual section of the window or door has its own Uf value which is correctly used for the calculations; the value indicated in the examples is an average reference value of the series). The lower the Uf value, the better the thermal performance of the windows and doors. 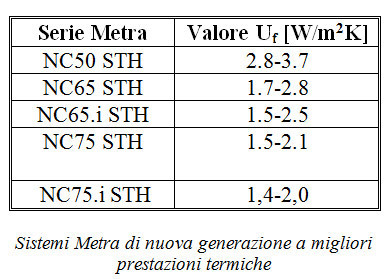 To give an idea of just one of the possibilities that METRA systems offer, the respective Uf values are reported below to which the Ug values of the glazing must be combined with, in order to obtain the Uw values to be compared with those in the tables of the relative Standard. 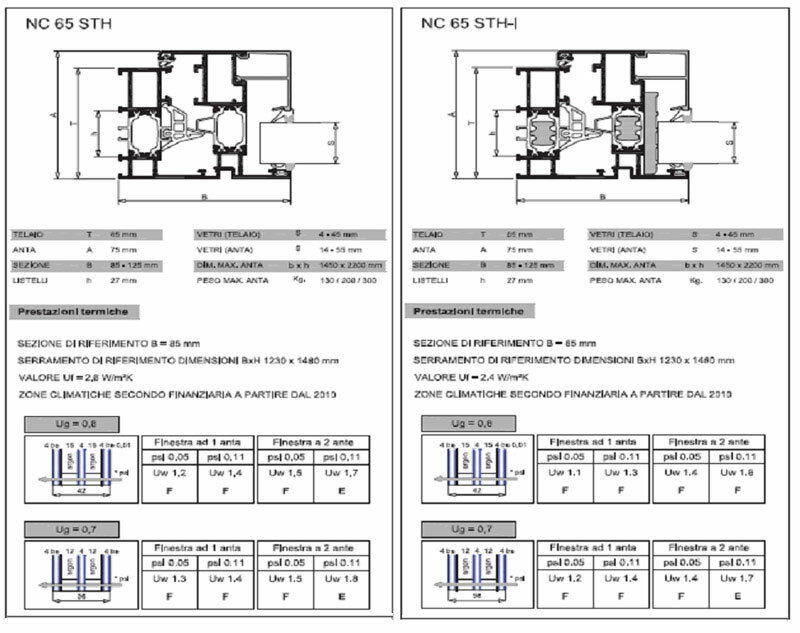 As can be seen from the figures, Metra Systems fully comply with the limits imposed by the Law and can also lead to significant cost savings over time.